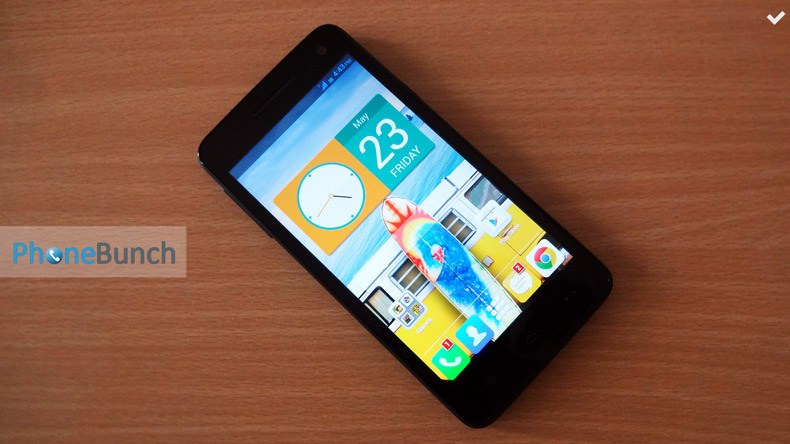 Micromax Canvas 2 Colours was announced at the perfect time at a perfect price. It features a 5-inch 720p display, 1 GB RAM, a first in the sub Rs. 10,000 segment with a quad-core processor no less. It also comes with 2 free back-panels within the box to customize your phone. So is this the best phone to get in the sub Rs. 10,000 segment? Let's find out in our Review of the Canvas 2 Colours A120. The Canvas 2 Colours A120 comes packed with great specifications. You get a 5-inch HD (720x1280 Pixels, 294 PPI) IPS display and the phone is powered by the quad-core MediaTek MT6582 chipset clocked at 1.3 GHz running Android 4.2.2 Jelly Bean with a promised Android 4.4 KitKat update. There's 1 GB RAM onboard with 4 GB internal storage with about 2.6 GB available but it is expandable upto 32 GB using microSD cards. You also have a notification LED embedded in the front earpiece. A 2000 mAh battery powers the phone. You have an 8 MP auto-focus camera at the back with LED flash which is bright. There is no secondary-noise cancellation microphone. A 2 MP front-facing camera is also available. The Canvas 2 Colours A120 is a dual-SIM, dual-standby device and uses two full-size SIM card slots. You get global roaming on 2G. It is a 3G capable phone as well. Bluetooth 4.0, WiFi b/g/n, FM Radio and GPS are also available. The Canvas 2 Colours A120 has a solid build quality and it weighs in at 168 grams with a thickness of 9.7 mm. There's a 5-inch IPS display in the front with three capacitive buttons at the bottom, they are visible even when the back-light is off and are quite sharp. There is no back-light bleed. Just above the display is a 2 MP front-camera, proximity & light sensors alongwith the earpiece which also has the notification LED embedded within it. The display is vibrant, color reproduction is accurate and with wide viewing angles. The front is covered in hardened plastic. On the left you have the volume rocker and the power button on the right. On the right you have the power lock/unlock button. The They are built of the same material as the back-cover. Buttons are easily reachable for single-handed use. The 3.5mm audio jack alongwith the microUSB data-syncing/charging port is at the top while the microphone at the bottom. The sides are covered by the back-cover giving your phone a new look with every back-panel. The back-cover has a matte finish which makes the phone easier to hold. There is no flex in the back-panel. You get a Blue/Grey back-cover on the phone with the additional two, yellow and blue, inside the box. All three are made of the same material and are equally sturdy. You have the 8 MP camera as well as the LED flash at the back, just below it is the Micromax logo and the speakerphone at the bottom. The speakerphone has two raised hoofs on its sides so that it is never in contact when phone is placed on a flat surface. They alongwith the camera bump at the back do prevent sound from getting muffled. There are two full-size regular SIM card slots alongwith the microSD card slot to the right capable of using upto 32 GB of storage. Just below is the battery compartment to house the 2000 mAh battery. The build is sturdy, the matte back-panels make the phone easier to hold as well. Overall the design and build of the Canvas 2 Colours A120 is very appealing. You get two free back-panels within the box, one yellow and the other turquoise. Both are made of the same material, matte finish and are sturdy as the back-cover which comes on the device. It completely changes the look of the Canvas 2 Colours A120 since it envelops the sides as well. Its like getting a new phone with those back-panels. Micromax has also added matching wallpapers to unify the look of the phone and the interface. You can have a look at our unboxing for first impressions and more images. There's a 5-inch HD IPS display on the Canvas 2 Colours. It has good color reproduction, wide viewing angles and excellent touch-response. We didn't have any issues with ghosting or freezing. Color saturation is also adequate. There is no visible pixelation, text and images look sharp. You also have Daydream available on the phone. Network reception and retention is good, we didn't have any issues with call quality. The earpiece and speakerphone are quite loud for calls even in noisy environments. There is no added distortion from the earpiece, both parties are able to hear each other well. The dialer has been customized and you have the option to record calls directly from the calling interface. You can also initiate video calls over 3G with the Canvas 2 Colours. Other network options include WiFi hotspot, Bluetooth and USB Tethering. You also have GPS built in with aGPS and EPO support. It is able to get your precise location within seconds when outside. There's a 8 MP auto-focus rear camera on the Canvas 2 Colours which takes good images. It is able to capture 8 MP still images in 4:3 aspect ratio and 1080p videos at 30 FPS. Both images and videos come out sharp. The camera here is much better than we expected. It uses a new camera app, which has two additional options, GIF Animation and Remove object. Both of which don't work that well. You also have HDR mode, Panorama mode, Scene detection shot as well as Smile shot. The new camera UI is easier to use with all options and settings available on the left. You can toggle between image and video modes. You also have Electronic Image Stabilization available which makes the video a bit jerky sometimes. The flash is bright and helps in low-light shots. But there is quite a bit of noise in low-light imaging. Macro shots at day time turn out sharp as so distant shots. The front-camera too is able to take good images in adequate lighting. There is a beauty mode available there using which you can reduce blemishes seen on your face in real time. Here are some image samples, you can see more on our Google+ Page. Here are two video samples shot at 1080p at 30 FPS with the 8 MP camera of the Canvas 2 Colours with EIS On and Off. The speakerphone is loud and clear, even if sounds a bit tinny. You can customize the audio output when playing songs using the built-in amplifier. Sound doesn't get muffled much when the phone is put on its back. The bundled headset is actually good enough for listening to music over long duration. Music playback is smooth, there is no added distortion. The speakerphone is loud as well. You can easily play high-bitrate content without any perceptible loss in quality. You get full-sound through the headphone jack as well. The built-in equalizer does work and you can customize it. The interface of the music player is quite different. It lets you move through a playlist by just swiping through the the album art covers. You also have a "Definite Time" option which allows music playback to be stopped after playing for the slated time. The button on the headset adds more functionality, you can play or pause tracks with a single tap while double tap lets you play the next song in the playlist. FM Radio is also available on the Canvas 2 Colours A120, you get stereo playback and recording. The headset needs to be plugged-in to listen to FM, the reception is clear and you can switch to the speakerphone as well. The Canvas 2 Colours supports 1080p video playback natively. MP4, MKV, AVI, 3GP files are supported right out of the box. You can play any other file format using MXPlayer or VLC for Android. Video playback is smooth, there is no lag in local videos. But the YouTube lag issue we saw on the XOLO Q2500 and Q1010i is present here as well. This is a mere compatibility issue nothing major and might be fixed in next YouTube app update. The video player on the A120 has also been customized, it allows you to lock the touchscreen and capacitive buttons for interruption free viewing. You also get a pop-up option, which overlays the currently playing video over all other apps and the launcher. So you can browse the web, Facebook or twitter streaming while playing videos. You have a 4 GB ROM on the Canvas 2 Colours out of which 0.98 GB is available as Internal storage and 1.61 GB as phone storage. But app and app-data are movable to the SD card. Plus you also get USB OTG support baked-in. You have many smart gestures available on the Canvas 2 Colours. Most make use of the proximity sensor and the accelerometer. You can unlock the phone by just waving over it, turn to silence the ringer or switch to speakerphone when on call, answer a call by bringing the phone close to your ear or dial an already entered number. You can even take a picture by just waving over the phone. You also have a small guide which shows you how the gestures work. These gestures work fine most of the time. The Canvas 2 Colours uses a custom skin over Android 4.2.2 Jelly Bean. But if you change the launcher you won't notice the difference immediately. But the launcher isn't that bad, it allows you to add widgets or app shortcuts by just tapping on them. You can add upto 9 homescreens in all. You can even customize homescreen and app-drawer transitions, sort apps in the app-drawer or even hide them. You also have customized clock, power, music and video player widgets. Its not a heavy skin, it is fluid and there is no lag. You also get custom wallpapers to match the back-cover, another addition to unify the experience. You also have lockscreen notifications and widgets available. But there's one thing about the interface which miffed me a little. Its that the tabs to switch between notifications and quick toggles in located at the bottom of the notification shade. It just feels wrongly placed since we have got used to the top right placement of the toggle. Now, Micromax has also promised an update to Android 4.4 KitKat, but there is no timeline on that front. We tested several apps especially Facebook, Skype, WhatsApp, Twitter among other and were unable to find any compatibility issues. Not many apps come pre-installed just the basic Google Apps and some Micromax games/apps which can be disabled. For web-browsing we returned to Chrome where too we didn't see any rendering issues with the sites we tested. Scrolling is fluid and so is text/image re-flow. Pinch-to-zoom also works great, there is no lag while browsing heavy websites. You get the Reverie Smartpad Keyboard on the Canvas 2 Colours A120 as well which has 20 regional languages support made popular by the Micromax Unite 2 but not highlighted for this phone. You get additional options of voice and face unlock which work well. You also have Android Device Manager to locate, ring, erase your lost device. The Canvas 2 Colours performed quite well at gaming. We played several high-end games including Asphalt 8, FIFA 14, MC4, NFS: Most Wanted, NOVA 3, GTA and Real Racing 3. There was no lag in any games and framerate remained consistent. The phone does get warm while playing games continuously and not in general use. We have heard some users saying that changing the cover to yellow or turquoise one makes a lot of difference to heat dissipation. Its strange and partly true as well, we did the gaming review with the blue cover on and the phone didn't feel hot, just warm. There are no issues with performance on the Canvas 2 Colours. There is no lag in the interface, gaming is almost flawless and so is web browsing. You can see our benchmark review below as well where we pitted the Canvas 2 Colours against higher-priced options like the XOLO Q1010i and the Moto G.
Battery-life is a bit of a letdown, you can barely make it through a day with mixed use. You would almost always have to charge the phone overnight, but if you are not online that much and restrict yourself to basic gaming you might get a bit more life out of the 2000 mAh unit. Now, although there is a no sign of the KitKat update till now, it must be said that KitKat has been optimized keeping battery-life in mind so you can see a significant improvement with the update. The Canvas 2 Colours is an excellent offering in the sub Rs. 10,000 segment. It blows the competition away with its performance, good display and build quality. Sure, it has its caveats. Battery-life could have been better and heat dissipation could have been handled better. But if you can keep that at the back of your mind, you get an excellent camera for the price, good build and free back-panels which completely change the look of the device. All-in-all the Canvas 2 Colours gives excellent value for your money.